In our existing project groups, there are numerous TIP technologies that are moving from the lab stage to field and production trials. Each trial has operator sponsorship and includes key members of our technology ecosystem. Together, these TIP teams are working to validate technologies, share learnings, and accelerate toward commercialization at scale. Simultaneously, TIP members are contributing designs and specifications for new technologies and building new network tools. Our TIP community is also growing and expanding in scope to address new challenges. Over the last month, TIP has added three new project groups and subgroups: Crowd Cell, Power and Connectivity, and Disaggregated Cell Site Gateways. At MWC, we are also announcing a new TIP community lab near BT’s Adastral Park campus in the UK and more than €100 million in venture capital funding available for infrastructure-focused startups participating in the TIP Ecosystem Acceleration Center (TEAC) in Germany. In addition, we are excited to welcome some of TIP’s newest members: China Unicom, Sprint, and Telenor. They join more than 500 companies around the world that are active within TIP. Crowd Cell is a new project group led by Vodafone. Crowd Cell is a concept based on relay architecture to help extend the range of existing cellular networks. Due to its plug-and-play design, Crowd Cell can be a rapid and low-cost small cell solution for traditional 4G networks. This project will focus on creating a Crowd Cell by leveraging generic hardware and open source designs for software to minimize costs through this “one design” flexible platform. Vodafone is developing new technologies designed to enable the cost-effective deployment of base stations in currently unconnected areas of Africa and India. The deployment will be supported by Vodafone’s new Open RAN technology and Facebook’s OpenCellular wireless access platform, which were developed within the Telecom Infra Project (TIP). Open RAN technology significantly reduces the costs of rolling out networks in rural areas, fundamentally improving the economics of providing data and voice services to millions of unconnected people. This new approach is expected to reduce the cost of radio network equipment by up to a third. Vodafone also believes Open RAN technology will jump-start the establishment of an end-to-end industry of software and hardware vendors and integrators that will drive innovation, which is critical for achieving such a complex endeavour. 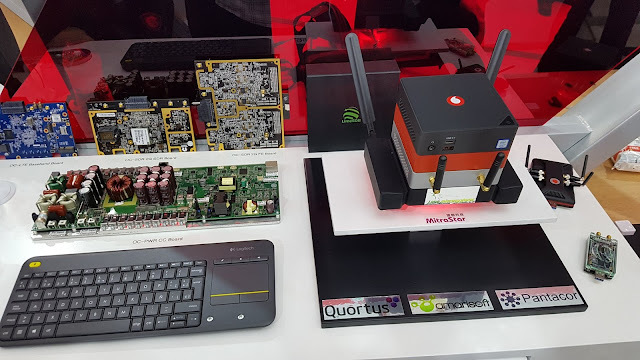 Vodafone has already conducted successful trials in India with two new vendors that have developed bespoke high-power base stations using software-defined radio and general purpose hardware based on Vodafone’s specifications and support. Wider scale trials are planned for later in 2018 where up to 200 sites will be equipped with the new technology. Tests are also currently ongoing in South Africa with TIP´s OpenCellular platform for 2G and 4G services. 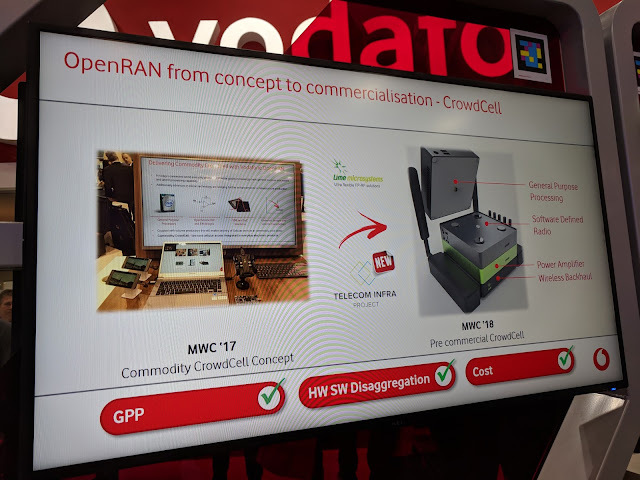 This OpenCellular technology is being showcased at Vodafone’s booth at Mobile World Congress 2018. Vodafone joined the TIP board in November 2017 and is a founding member and co-chair of TIP’s Open RAN project group, which aims to develop fully programmable RAN solutions based on general purpose processing hardware and disaggregated software. TIP is an engineering-focused initiative driven by operators, suppliers, integrators and startups to disaggregate the traditional network deployment approach. The acceleration and expansion of this collaborative trend – embodied by TIP – will lead to significant change in the telecom industry and provide the ability to connect millions of people in rural communities for the first time. Beyond radio, Vodafone and TIP are working together with Cumulus, Zeetta Networks and the University of Bristol’s High Performance Networks Group on evolving Voyager, the industry’s first white-box transponder and routing solution. Vodafone will demonstrate Voyager’s capabilities in a trial in April. Vodafone is also founding a new TIP sub-group within the Open Optical & Packet Transport project group focused on transport on disaggregated cell site gateways. Similar to the gateways in radio, these would reduce the current vendor lock-in that operators face in transport networks. Cell site gateways will be also based on off-the-shelf hardware, open software and interfaces on a technology agnostic platform. Here is a slide deck that I prepared and shared on 3G4G blog here. The part embedded below starts from Vodafone section. Happy to hear your views on TIP or Vodafone's CrowdCell announcement. Please add them as comments. I would argue that if this is an RRU (Remote Radio Unit) then its probably not a small cell but let's leave that one for another day. Comment mentions: Either T-Mobile or Verizon. Likely done by Modus. Might be worth checking out this earlier post here too. 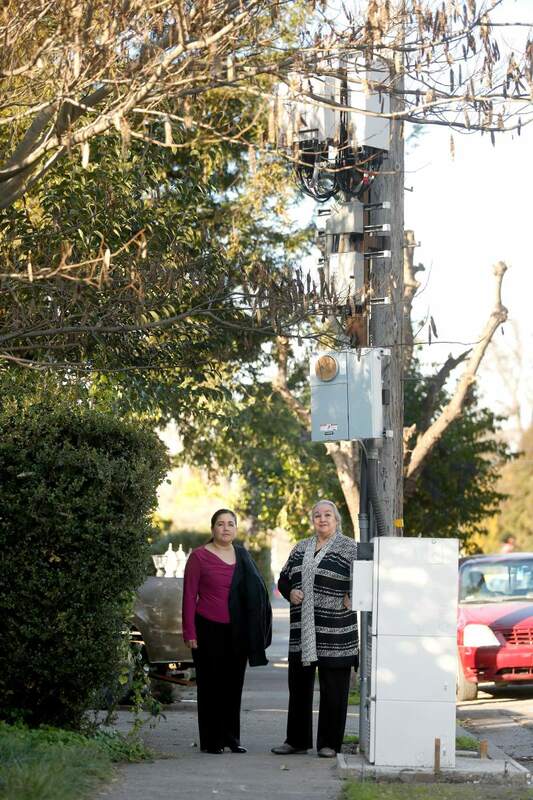 A city-sanctioned bid to improve wireless connectivity for internet and cellphone users in Santa Rosa has run into opposition from some residents and generated concern among city officials after the first round of “small-cell” antennas went up on utility poles in recent weeks. Definitely a scope for improvement out there. 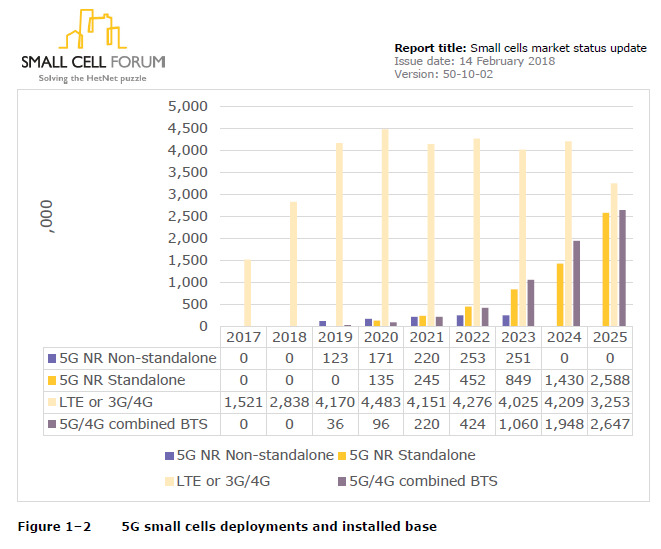 Small Cell Forum recently released the updated 'Small cells market status report February 2018'. It contains the latest SCF market status update, which is based on operator surveys, modelling and forecasts, completed between November 2017 and February 2018. A total of 105 operators’ deployment plans were surveyed or modelled. 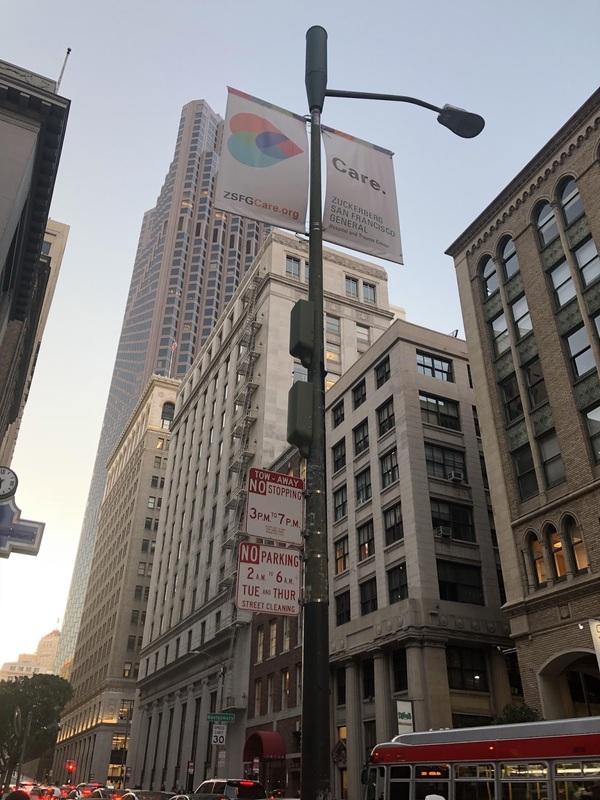 The forecasts now include the first phases of 5G small cell deployment. SCF members can access the full data set associated with this report from the Resources folder on the member website. 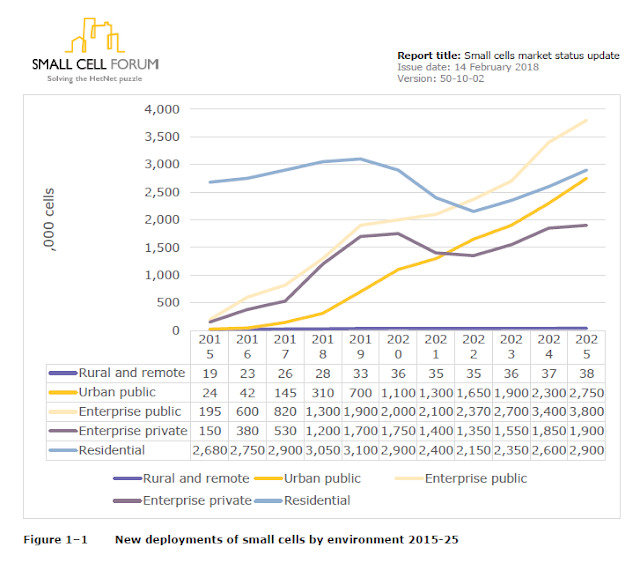 The report confirms the continuing growth of small cells in non-residential scenarios – notably urban and enterprise sectors – and sees 5G, virtualization and densification playing a strong role in that growth. It also highlights the significance of ensuring simple, scalable and repeatable deployment processes. SCF is working with regulators globally to make this happen. The installed base of small cells to reach 70.2m in 2025. Densification initially led by APAC and North America, with Europe lagging as it works to address commercial, technical and regulatory barriers. 5G cell deployments overtaking 4G by 2024. The total installed base of 5G or multimode small cells in 2025 is predicted to be 13.1m, over one-third of the total in use. 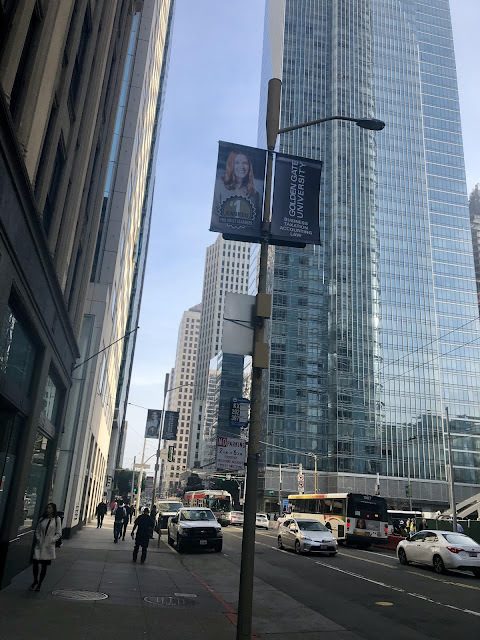 A stronger emphasis on virtualization, notably for 5G and multimode 4G/5G small cells. Virtualized systems will grow at a CAGR of 52% to reach 57% of the total in 2025. The vast majority of new deployments to be in dense or hyperdense environments by 2025. C-Band and high frequency bands to be the most important bands for 5G small cells. 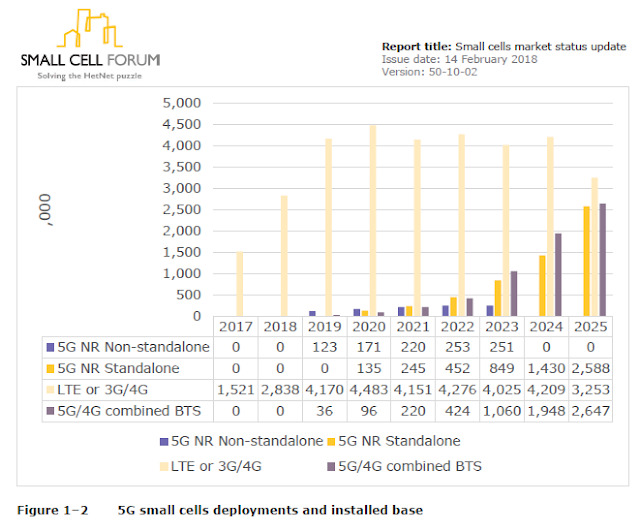 Strong support from operators for the deployment of 5G small cells as their 5G capacity layer where LTE remains the coverage layer.